Corporate Warehouse Services operates in the center of the mid-South providing Order Fulfillment Services, Container Stripping and Packaging, as well as Warehousing and Shipping Just-in-Time to your customer. This segment offers temporary and permanent outsourcing solutions for your Just-in-Time manufacturing programs and inventory control especially during peak demand. 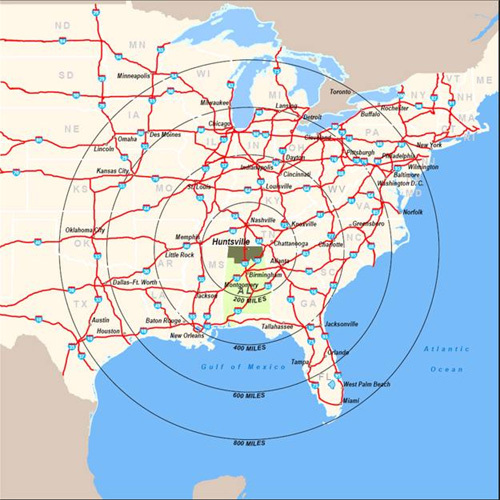 Mileage between CWS and these destinations: What percent of Inbound and Outbound freight is processed thru these facilities that service the Decatur/Huntsville area? Take Exit 340A (AL-20W to Decatur). After the bridge at the first red light, take a right (continuing on AL-20 W) by the Holiday Inn. In the next 4 miles, you will cross (3) sets of railroad tracks. After a third set of RR tracks, take the first right (red light) onto State Docks Road. Then take the first right onto Commerce Dr. CWS is located in the first curve on the right. For inbound and outbound freight, go straight in curve onto gravel road to warehouse docks. Continue on US-72 until AL-20E and follow AL-20E to Decatur for approx. 150 miles. When you get to Trinity, AL, there will be a Jacks on the left at an intersection (red light). Go to the next intersection (red light) and turn left onto State Docks Road. Take the first right onto Commerce Dr. CWS is located in the first curve on the right. For inbound and outbound freight, go straight in curve onto gravel road to warehouse docks.